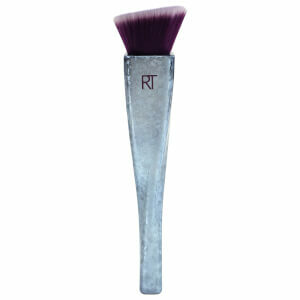 Real Techniques Expert Face brush is ultra firm and broad, perfect for the application and blending of cream or liquid foundation. If you’re lazy (guilty), this is the makeup brush you need in your collection. A small but not too small rounded brush, this works for pretty much every formulation: I’ve used with liquid foundation, gel blush, setting powder, etc. The synthetic bristles also mean you don’t have to use as much product. In short, I’m a big fan. I use it to blend out kevyn aucoin sculpting powder. Great! Good material, good brush. It could pick up some more product. I am using Loreal Tru Match and with this brush it gives me a flawless face. Though it takes time as the brush head is a bit smaller than expected. But overall I'm satisfied. 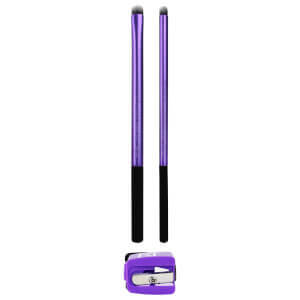 This brush helped me to love put on my makeup! Before I used to put on my liquid foundation with my fingers, and I hated to wash my hands 2-3 times after that..... Then, I've tried several brushes, but only now, with this brush, I have my make up in 2minutes, and I'm ok! And I use less product, so that's a bargain!! Really, in this very little thing, this brush has changed my life!!! This is such a good foundation brush! I absolutely love it, it actually helps with my drypatches and makes my foundation look less cakey. Blends beautifully and because it's so small (when I got it I was really surprised since compared to other foundation brushes it's quite tiny) it's really easy to clean and it's dry after only 3 hours or less! I also like to use it with some of my hard to work with, extremely pigmented but hard to blend blushes, which works really well too. You can really work it in and blend it. Love this brush so much! I ordered two, one for me and one for a friend. Mine was tied firmly. The other one was more tied loose. We switched as I like it more when it is not that tied for a powder brush. Overall, it is of good quality for a nice price. Another great brush from RT. I use it with liquid foundation, it is great for applaing it fast.